"I'll Wait" and "Panama" both had "Drop Dead Legs" and "Girl Gone Bad" as B-Sides, but they swap places depending on country. The UK version of "Panama" had "Girl Gone Bad," while the US version had "Drop Dead Legs." The UK version of "I'll Wait" had "Drop Dead Legs," and the US had "Girl Gone Bad." "1984" (stylized as MCMLXXXIV on the album's front cover) is the sixth studio album by American hard rock band Van Halen. It is Van Halen's biggest-selling album, with 20 million copies shipped in the United States. 1984 reached number two on the Billboard 200 album chart and remained there for five weeks, behind Michael Jackson's "Thriller" (where Eddie Van Halen made a guest performance). It produced several memorable singles, including "Jump", Van Halen's only number one single on the Billboard Hot 100; the top-20 hits "Panama" and "I'll Wait"; and the MTV favorite "Hot for Teacher". 1984 was the last Van Halen album to feature lead singer David Lee Roth until 2012's "A Different Kind of Truth", and the final full-length album with all four original members. Reportedly dissatisfied by the concessions he had made to Van Halen's frontman David Lee Roth and producer Ted Templeman on the group's previous album, the #3 Billboard album hit "Diver Down"—both of whom had discouraged Eddie Van Halen from making keyboards a prominent instrument in Van Halen's music—Eddie Van Halen built his own studio in his backyard. Eddie Van Halen named that studio 5150 (after the Los Angeles police code for "escaped mental patient.") At 5150, Eddie Van Halen composed Van Halen's follow-up to "Diver Down"—without as much perceived "interference" from Roth or Templeman. The result was a compromise between the two creative factions in the band—a mixture of keyboard-heavy songs, and the intense rock for which the band had become world famous. In Rolling Stone's retrospective review of 1984 in its 100 greatest albums of the 1980s, producer Ted Templeman said, "It's real obvious to me [why 1984 won Van Halen a broader and larger audience.] Eddie Van Halen discovered the synthesizer." The review continues, "The foursome had been selling out arenas for 5 years on the basis of Eddie's virtuosic, fleet-fingered guitar playing, singer David Lee Roth's blunt, raunchy lyrics and the brute force of Michael Anthony's bass and Alex Van Halen's drums. But 1984, abetted by tunes that swirled elements of synth pop into metal—most evidently on the hit single "Jump"—and by a string of campy, low-budget videos that found favor on MTV, carried Van Halen to a new plateau of popularity. No longer viewed as threatening to those with a chronic fear of metal, the band somehow became amusing and even endearing to middle America. "At the time, Eddie was in the process of building his own studio with Donn Landee, the band's longtime engineer (and later producer on "5150" and "OU812"). While boards and tape machines were being installed, the guitarist began fiddling around on synthesizers to pass the time. "There were no presets," says Templeman. "He would just twist off until it sounded right." 1984 features Van Halen's most prominent use of keyboards to date, particularly on the album's first two hit singles "Jump" and "I'll Wait", as well as the album's one-minute synthesizer and effects instrumental, "1984" (which had been previously incorporated into bassist Michael Anthony's solo on Van Halen's 1982 world tour). The summer saw the release of the album's third single "Panama", which featured a heavy guitar riff reminiscent of Van Halen's earlier work (the engine noise was from Eddie revving up his Lamborghini, with microphones being used near the tailpipes). Later, a video of "Hot for Teacher" was released and played regularly on MTV, giving the band a fourth hit which further sustained sales of the album. Other songs on "1984" included "Girl Gone Bad", parts of which previously had been played during the 1982 Tour amidst performances of "Somebody Get Me a Doctor" (most famously at the US Festival show), the hard rock "Drop Dead Legs" and "Top Jimmy", a tribute to James Paul Koncek of the band Top Jimmy & the Rhythm Pigs. The album concludes with "House of Pain", a fiery, heavy metal song that dates back to the band's early club days of the mid-1970s. During an interview for the King Biscuit Flower Hour radio show in 1985, Eddie claimed to have written, "Girl Gone Bad" in a hotel room that he and his wife at the time Valerie Bertinelli had rented. Valerie was asleep, and Eddie woke up during the night with an idea, he had to put on tape. Not wanting to wake Valerie, Eddie grabbed a small cassette recorder and recorded himself playing guitar while in the closet. Eddie Van Halen claims to have written the arrangement for "Jump" several years before "1984" was recorded—in a 1995 cover story in Rolling Stone, the guitarist claimed that Roth had rejected the now-famous synth riff for "Jump" for at least two years before agreeing to write lyrics to it. In his memoir Crazy From The Heat, Roth confirms Eddie's account, admitting a preference for Van Halen's guitar work; however, he claims to now enjoy the song. Additionally in his memoir, Roth writes that he wrote the now-famous lyrics to "Jump" after watching a man waffle as to whether to commit suicide by jumping off of a skyscraper. The iconic cover was created by graphic artist Margo Nahas. It was not specifically commissioned; Nahas had been asked to create a cover that featured four chrome women dancing, but declined. Her husband brought her portfolio to the band anyway, and from that material they chose the painting of a putto stealing cigarettes that was ultimately used. The model was Carter Helm, who was the child of one of Nahas' best friends, whom she photographed holding a candy cigarette. The cover, featuring as it did the smoking putto, was 'censored' in the UK by the addition of a sticker that obscured the cigarette in the putti's hand, and the packet of cigarettes; but the censoring of the cover is cancelled. The album's original release credits all songs to Edward Van Halen, Alex Van Halen, Michael Anthony and David Lee Roth. The label on the UK single release for "I'll Wait" (catalog #W9213) credited Michael McDonald as a co-writer, but he was not credited on the US version of the single (catalog #7-29307). Songs from this album which appeared on compilations released after a royalty renegotiation with the band's label Warner Bros. (Best Of - Vol 1, 1996) and a lawsuit brought by Roth (during the preparations for The Best of Both Worlds compilation, 2004), were credited to Edward Van Halen, Alex Van Halen and David Lee Roth, with Michael Anthony's name removed from the credits, as evident in the end song credits of the 2007 film Superbad. Subsequently, Anthony has been removed from all songwriting credits on the "1984" album. The ASCAP entry for "I'll Wait" lists Michael McDonald as co-writer with Roth and the Van Halens. Like many bands starting out on their career, Van Halen shared songwriting credit equally between all members (including guitar instrumentals, which were clearly composed only by Eddie), but subsequent claims would lend credibility to the view that all songs were entirely or predominantly written by Eddie Van Halen and David Lee Roth, with little input from Van Halen's rhythm section. In 2004, Roth discovered that the rest of the band had renegotiated a more preferential royalty rate with Warner Bros. for all releases made during his time as lead singer, giving them a royalty rate five times greater than his. This was later rectified. "1984" peaked at #2 on the Billboard Magazine album charts, (behind Michael Jackson's "Thriller", which featured an Eddie Van Halen guitar solo on "Beat It",) and remained there for 5 straight weeks. As previously noted, it contained the anthems "Jump", "Panama", "I'll Wait" and "Hot for Teacher". "Jump" reached #1 on the Billboard Hot 100. 1984 is the second of two Van Halen albums to have achieved RIAA Diamond status, selling over ten million copies in the U.S. alone. "Jump" was one of the most successful singles of 1984, spending 5 weeks at the Billboard's #1 position. It sold over three million copies alone, making it one of the four best-selling rock songs of the 1980s. The album's follow-up singles - the synth-driven "I'll Wait," and then perhaps the original Van Halen line-up's most straight-ahead rocker, "Panama", each peaked at Billboard #13, (Pop,) respectively, in March and June. "Hot for Teacher", a bombastic hard rock boogie, was a moderate Billboard Hot 100 success, reaching #56; however, the MTV video for "Hot For Teacher" became wildly popular, making it one of Van Halen's most well-known songs. The "Hot For Teacher" video stars pre-teen lookalikes of the four Van Halen band members; a prototypical nerd named "Waldo;" David Lee Roth as Waldo's bus driver; and numerous teachers stripping. "Jump;" "Panama;" and "Hot For Teacher" remain three of the most popular rock songs played at American arenas in the 2010s. 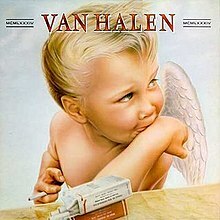 When Van Halen's 1984 was released in the UK, a removable sticker with the Roman numerals MCMLXXXIV (which is "1984"), had to be placed over the cherub's hand, as it was holding a cigarette and there happened to be a non-smoking campaign happening at the time. The same protocol was upheld for several other bands' albums as well, such as the UK release of Canadian rocker Kim Mitchell's album "Akimbo Alogo", where the entire cover was changed due to a smoking reference. Reviews for 1984 were generally favorable. Robert Christgau rated the album a B+. He explained that "Side one is pure up, and not only that, it sticks to the ears" and that "Van Halen's pop move avoids fluff because they're heavy and schlock because they're built for speed, finally creating an all-purpose mise-en-scene for Brother Eddie's hair-raising, stomach-churning chops." He also called side two "consolation for their loyal fans--a little sexism, a lot of pyrotechnics, and a standard HM bass attack on something called 'House of Pain'." J.D. Considene, a reviewer for Rolling Stone, rated "1984" four out of five stars. He called it "the album that brings all of Van Halen's talent into focus." He stated that ""Jump" is not exactly the kind of song you'd expect from Van Halen", but that "once Alex Van Halen's drums kick in and singer David Lee Roth starts to unravel a typically convoluted story line, things start sounding a little more familiar". Although he mentioned "Jump"'s "suspended chords and a pedalpoint bass in a manner more suited to Asia", he went on to state that "Eddie Van Halen manages to expand his repertoire of hot licks, growls, screams and seemingly impossible runs to wilder frontiers than you could have imagined." He concluded that "what really makes this record work is the fact that Van Halen uses all this flash as a means to an end—driving the melody home—rather than as an end in itself" and that "despite all the bluster, Van Halen is one of the smartest, toughest bands in rock & roll. Believe me, that's no newspeak"
A retrospective review by Allmusic's Stephen Thomas Erlewine was extremely positive. He noted that the album caused "a hoopla that was a bit of a red herring since the band had been layering in synths since their third album, "Women and Children First". He further stated that "Jump"'s "synths played a circular riff that wouldn't have sounded as overpowering on guitar", but that "the band didn't dispense with their signature monolithic, pulsating rock." He also stated that "where [previous] albums placed an emphasis on the band's attack, this places an emphasis on the songs, and they're uniformly terrific, the best set of original tunes Van Halen ever had." He concluded that "it's the best showcase of Van Halen's instrumental prowess as a band, the best showcase for Diamond Dave's glorious shtick, the best showcase for their songwriting, just their flat-out best album overall. [...] [T]here's no way Van Halen could have bettered this album with Dave around (and they didn't better it once Sammy [Hagar] joined, either)." At the end of the 1980s, Rolling Stone, which had previously been critical of Van Halen, ranked 1984 at number 81 on its list of the 100 Greatest Albums of the 1980s. On the original release, all music and lyrics were credited to Eddie Van Halen, Alex Van Halen, Michael Anthony and David Lee Roth, except where noted. However, as per the above notes in 'Songwriting credits', from 2004 this was changed to just Edward Van Halen, Alex Van Halen and David Lee Roth; removing Michael Anthony. Warner Bros. 92-3985-1 stereo (1984). Album produced by Ted Templeman.